First picking event of the year. Come join us! 10 spaces offered. Free & Family friendly! Meet at the parking lot next to the park! Ride to 5 houses picking rhubarb in Avonmore, Hazel Dean and Argyll and King Edward Park districts. Rhubarb will be divided between pickers, home owners and charity. Donations will go to YESS on Whyte Avenue. Bike and helmet required and a backpack/bike bags or trailer to carry rhubarb. Weather permitting (heavy rain and thunderstorms may cause a postponement of meet to Sunday June 11 at same location and time). Volunteers will be notified Saturday morning! 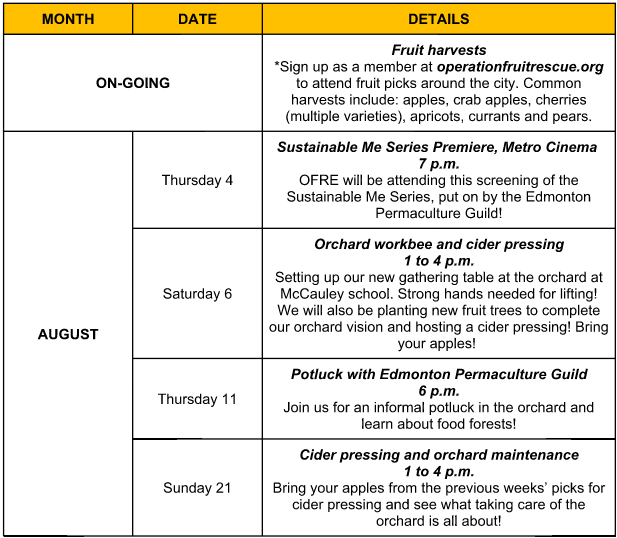 We encourage you to sign up as on OFRE member which allows you to come to all our other fruit picks of the summer. This entry was posted in news on June 10, 2017 by ofredmonton. OFRE values the importance of togetherness; a vibrant community strengthens all of us. For OFRE, community is defined as “a group of people living in the same place or having a characteristic in common,” or “a feeling of fellowship with others established by shared beliefs, interests and goals.” We connect with the community through events, and we interact with people who share the same interests as we do. The micro-orchard we designed and installed at McCauley School is home to OFRE and its community. It will always be a guiding light to our mission, vision, and values. We take great pride in our space for it is a place to gather, congregate, and share. We are grateful for those talented artists who have generously donated their time and expertise in the effort to better this organization. As our connections are solidified, OFRE becomes more resilient to unexpected crisis and challenging alteration. We especially would like to thank, Jill Stanton, one of Edmonton’s leading illustrators who created our logo, and the high standard of excellence rendered in her work exhorted us to thrive as a new organization. We also would like to show gratitude to Justine Ma who contributed her talent for graphic design to the table we have in the orchard. The table required several days to optimum temperature without rain so the graphics could be painted, and a clear resin could be applied over the artwork. We were honored to have Stephen Yettaw, an international stone sculptor, enthusiastically take on the project of carving our feature entry sign. The stone weighed over 3,000 pounds, and had been carved into a solid red granite. It took Stephen over a week of solid carving and cutting to carve our logo out into red granite and carve the text. Like how he had made all his sculptures, our stone was also carved at his mother’s fruit orchard — Flying Rabbit Fruit Farm in St. Paul. We also appreciate the help from Lee Grant, the owner of Fat Fred Hauling Co who not only picked up the rock but also drove our volunteers and our orchard manager Mike Johnson to meet with Stephen. Moments like that makes us realize that many people are great, caring, and loving; the community flourishes because of them. Our orchard still needs improvement, and we look forward to collaborating with bicycle commuters to design and build new bike racks for the orchard. We expect something amazing to take place in January for the man behind the pedal powered apple crusher has agreed to work with us again! We also have benches to fabricate out of offcut glulam beams donated by Western Archrib, an Edmonton-based company. As we wind down for the season, we want to thank all our volunteers for their efforts in growing fruit, picking fruit, sharing fruit, and working as active members of the board. We are so grateful for your energy and enthusiasm. We will keep you posted on events for next season. Step by step, we continue to build our community and share our stories to inspire you to find the fruit hidden in our city. This entry was posted in news on November 25, 2016 by ofredmonton. Join us at the Orchard! Located behind McCauley School at 9538 107 AvenueOFRE is hosting or participating in the following events and want to see you all there! We could always use help from like minded individuals and organizations. If you are interested please send us an e-mail to with the subject line : Volunteer on committees info@operationfruitrescue.org. 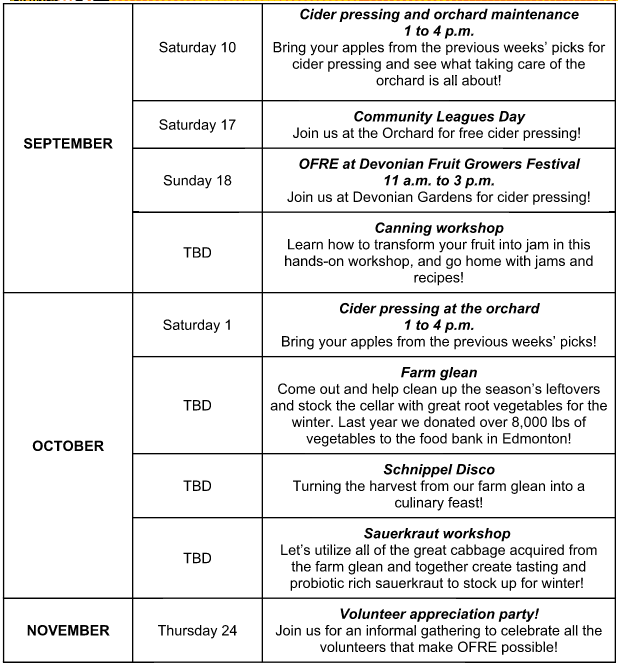 This entry was posted in news and tagged 2016, calendar, Events, micro-orchard, OFRE, Operation Fruit Rescue Edmonton on August 2, 2016 by ofredmonton.